This particular rosary is of German origin and dates back to the late medieval/early modern period. It is composed of ivory, silver, and partially gilded mounts. German Rosary. (17.190.306) Gift of J. Pierpont Morgan, 1917. New York: The Metropolitan Museum of Art. 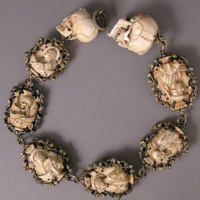 “German Rosary,” Medieval London, accessed April 22, 2019, http://medievallondon.ace.fordham.edu/items/show/29.